Argentina announced Tuesday that it reached a $900 million preliminary accord to settle its pending debt with 50,000 Italian holders of defaulted Argentine government bonds. Finance minister Alfonso Prat-Gay said that the agreement with Italian bondholders includes the Argentine government’s acknowledgement of the debt “and reasonable interest”. ”It represents approximately 15% of the debt that remained outside the (rescheduling) accords“ Prat-Gay told a press conference in Buenos Aires. Task Force Argentina which represents 50,000 Italian bondholders that agreed to the deal, said in a statement that the government would pay cash to settle about $900 million in defaulted debt, plus interest. It said the total amount is equivalent to about 150% of the original principal, or $1.35 billion. The Italian bondholders had sought about $2.5 billion from Argentina during arbitration at the World Bank’s International Centre for Settlement of Investment Disputes, or ICSID. Task Force Argentina indicated claims by the Italian bondholders will be dismissed. Prat-Gay said that the prospective deal with the Italian bondholders is a step toward ”closing the gap with the firmest litigants,“ that is, the hedge funds headed by U.S. magnate Paul Singer. Those hedge funds acquired Argentine bonds on the secondary market at large discounts following Buenos Aires’ massive 2001 debt default and refused to take part in the 2005 and 2010 debt restructurings. The Singer-led plaintiffs won a ruling from U.S. District Judge Thomas Griesa ordering Argentina to pay them $1.3 billion plus interest before making further payments to the bondholders who accepted the restructurings. 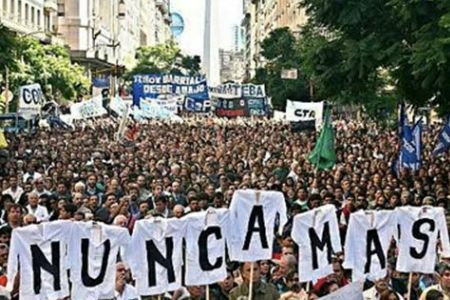 While former President Cristina Fernandez was adamant about not paying Singer and the other litigating holdouts, the administration of president Mauricio Macri, who took office in December, will present a new proposal this week in hopes of resolving the dispute. ”We are going to be tough in the negotiation over the interest”, underlined the Argentine officer. About 93% of Argentina’s creditors had agreed to exchange their defaulted bonds in 2005 and 2010 for new securities worth about 33 cents to the dollar. The remaining 7% that held out for better deals included the Italian bondholders, as well as U.S. hedge funds that sued Argentina in New York for full repayment. This latest accord comes as the Argentine government is holding talks this week in New York with the hedge funds, which bought the soured debt at cut-rate prices after the default. On Monday, Daniel Pollack, a court-appointed mediator between the hedge funds and Argentina in New York, said the country was facing claims from holdout creditors for about $9 billion.